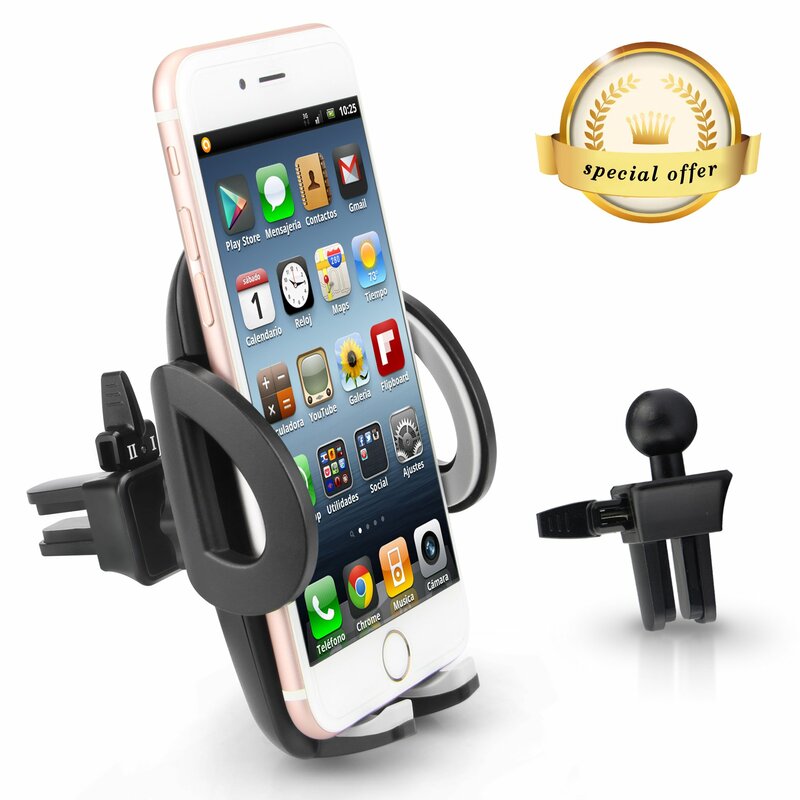 Home › Electronics › Phone Holder - Teletrogy Universal Adjustable Air Vent Car Phone Holder Cradl.. Phone Holder - Teletrogy Universal Adjustable Air Vent Car Phone Holder Cradl..
New Upgrade Version: Teletrogy phone holder with a fashionable and new design appearance. Two adjustable clamps and two support feet stabilize your device. The soft rubber layer protects your device from scratches. **Attention Please** ---- We never authorize any seller to sell our "Teletrogy" products. "Teletrogy" ONLY Sold by "venus-tech"
Just A Finger to Push: The phone holder is easy to install, no need to use tools to mount your smartphone or GPS-device. The easy one-touch mounting system locks and releases the device with just a push of a finger. 360 Degree Rotation: The fully adjustable ball joint allows 360-degree swiveling and rotation for optimal viewing angles of your device. Can be up, down, diagonal, or side-to-side whatever you desired. Broad Compatibility: With stretchable clamp that is able to hold devices in sizes from 50mm to 100mm wide, broad compatible with iPhone SE 6s 6 Plus 5s 5, Samsung Galaxy S7 S6 S5 Note5, LG Nexus Sony HTC and more. 100% Quality Guaranteed: Teletrogy will provide a 100% quality guaranteed, efficient and always satisfying customer service. If you have any quetions or problems, don't hesitate to contact us! Color: Black Double Security The clamp offers three directions to clamp your mobile phone and also comeswith 2 support feet to stabilize your device. The soft rubber layer protects your device from scratches, the outwardappearance fashion natural. Full 360 Degree Rotation The 360 degree rotation allows you to adjust your viewing angle easily howeveryou like. Set your hands free while listening to music, radio or picking up calls togive you a enjoyment during the while driving. Release Button for Simple Operation Press the button on the back of the unit to slide open the arms and pick orplace the mobile phone or GPS. Press the arms on both sides to clamp the mobile phone. Universal Fit The phone holder includes two adjustable clamps making it compatible with mosttypes of air vents. The stretchable clamps can hold devices from 50mm to 100mm wide, suitable formany different sizes and types of equipment, such as iPhone SE/6s/6 Plus/5s/5c/5/4s, Samsung Galaxy S7 Edge/S6/S5/Note5,LG, Nexus, Sony, HTC, Motorola and other smartphones and GPS-devices. Seller Warranty With 100% Satisfaction, If you have any question, please contact usimmediately and we will be happy to send you a replacement or refund yourmoney.